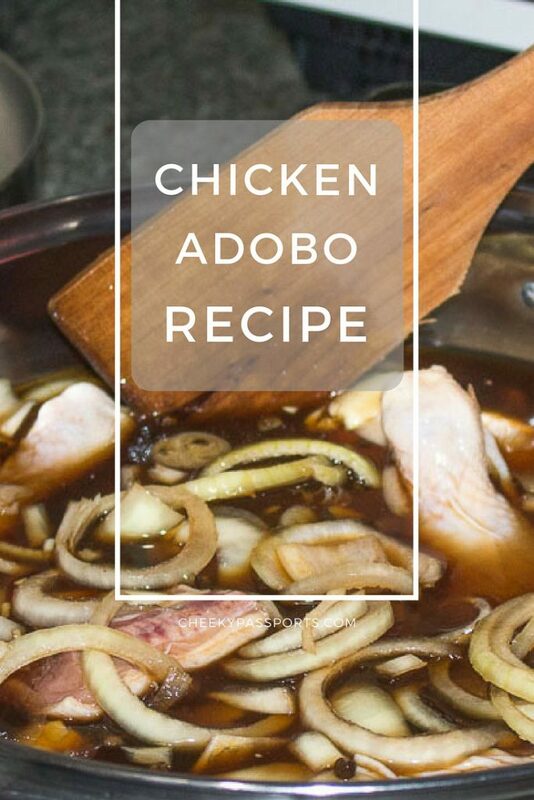 Perhaps there is no dish that encompasses Filipino cuisine, culture and history in the same way that the Adobo does. 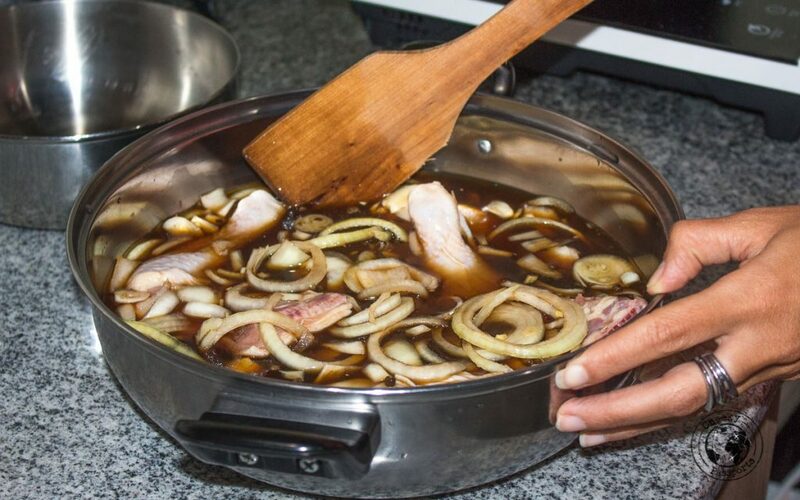 The dish consists of meats marinated in vinegar, soy sauce, peppercorns and garlic cooked until very tender, whereupon the meat and thickened sauce is served over rice. 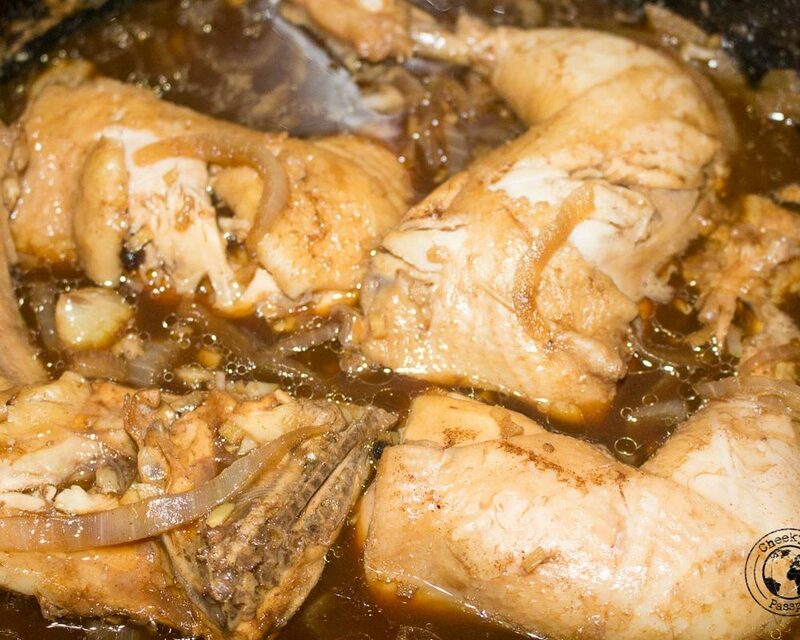 Pork and chicken are typically used due to their wide availability in the Philippines. One of the ways in which we try to save money whilst traveling is to cook our own food wherever we can. 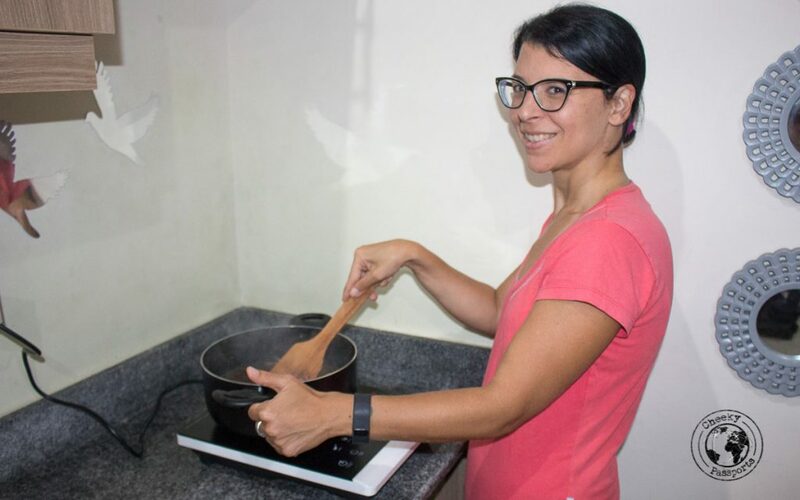 Unfortunately, this is rarely possible since we tend to stay in guesthouses without cooking facilities a lot more often than we stay in private apartments. 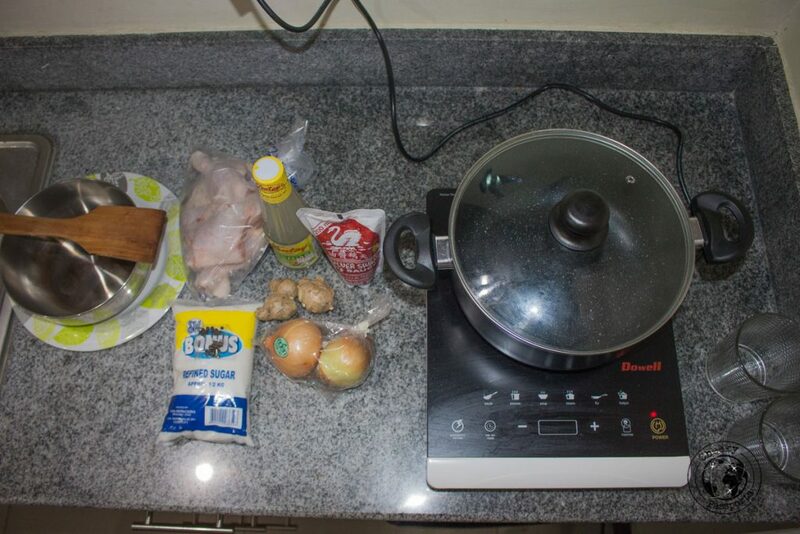 However, we did manage to book a small studio flat with a kitchenette in Cebu City where we could make our own meals over a little burner, so here we take you through Cheeky Passports’ own Chicken Adobo recipe. Disclaimer: we had to make some substitutions due to the unavailability of ingredients in the local store but tried to stay true to the original recipe as much as possible. 25g brown sugar (we used white sugar since no brown sugar was available at the local store). 1. 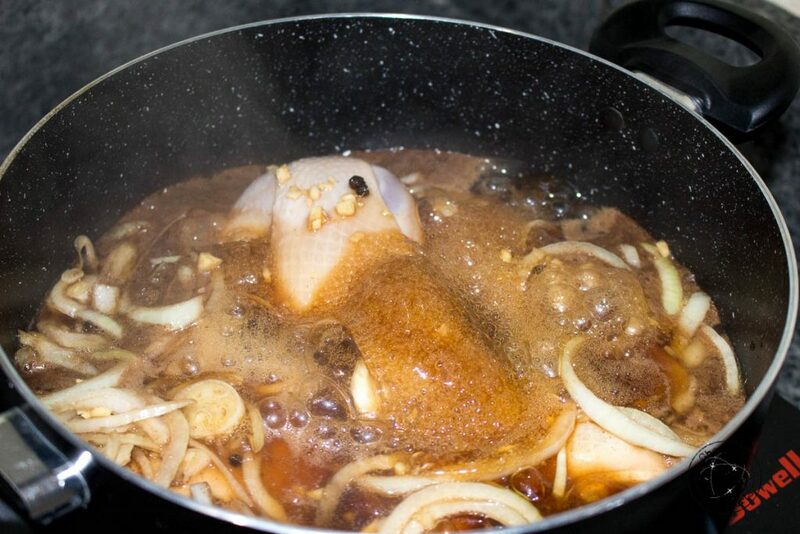 Place the vinegar, soy sauce, garlic, ginger, sugar, peppercorns, onion and 250ml water in a large bowl. If using chillies and bay leaves, place them in the bowl too. Stir well to combine the ingredients. Add chicken and stir one more to coat. Marinate in the bowl for about 30 minutes. 2. Transfer the mixture to a large pot. Bring to the boil over high heat. 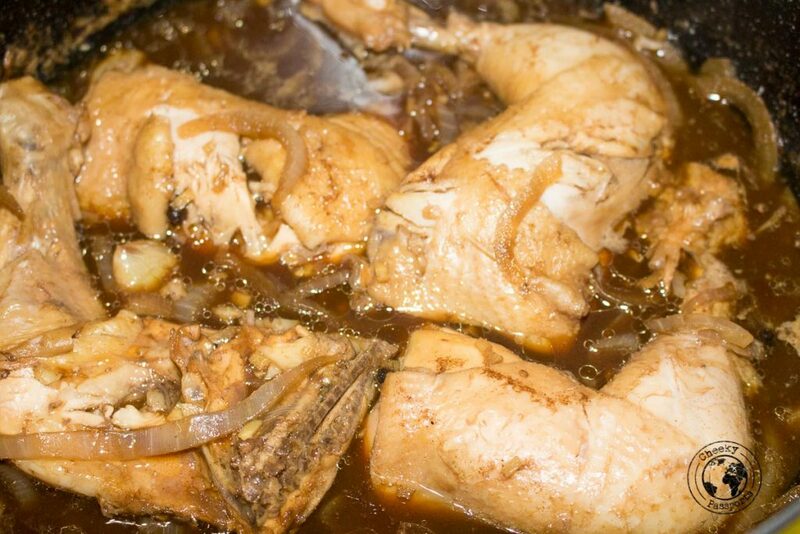 Reduce heat to medium, and simmer, stirring occasionally, for about 25 minutes or until chicken is cooked. Do not overcook! 3. Remove the chicken thighs and transfer to a bowl. Simmer the sauce until reduced by half and slightly thickened (about 10 minutes on our burner). 4. Return the chicken to the pot and stir to combine. Cook for a further 5 minutes or until the chicken is cooked through. Cool for a further 5 minutes. 5. 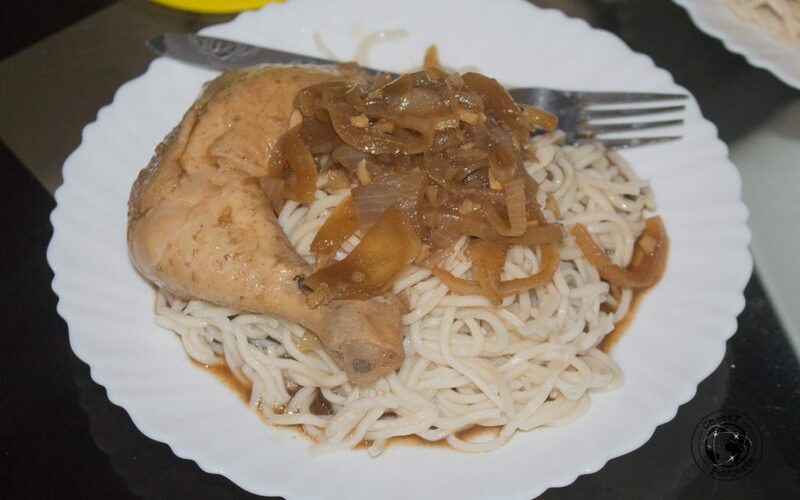 Divide the chicken adobo among serving plates on the rice or noodles, and pour over some sauce. Such a detailed explanation! Will drone guys! Hey Alister, Don’t worry about the auto-correct… we all had our moments with it! :p thanks for your nice comment! I hate autocorrect I meant will done! F*** autocorrect I meant well done!